After 23 minutes of overtime hockey, the Terriers edged the Crimson, 3-2, and will advance to play Northeastern in next Monday's tournament finale. In a thrilling double overtime rematch of last year's Beanpot final, the Crimson tossed 49 shots at BU's net but ultimately fell, 3-2. BOSTON — A big stage. Two big teams. A big finish. None of these circumstances were the least bit surprising in Monday night’s Beanpot semifinal game between the Harvard men’s hockey team and Boston University. The bout required extra time to declare a winner, but after 23 minutes of overtime hockey, that winner was BU, courtesy of freshman forward Ty Amonte. The Terriers edged the Crimson, 3-2, and will advance to play Northeastern in next Monday's tournament finale. With tired legs on both sides of the ice, the rookie strode into the offensive zone with the puck and fired a wrist shot short-side on tri-captain goaltender Merrick Madsen. The seemingly routine save snuck by Madsen and cued the cheers from what remained of a BU fan section. 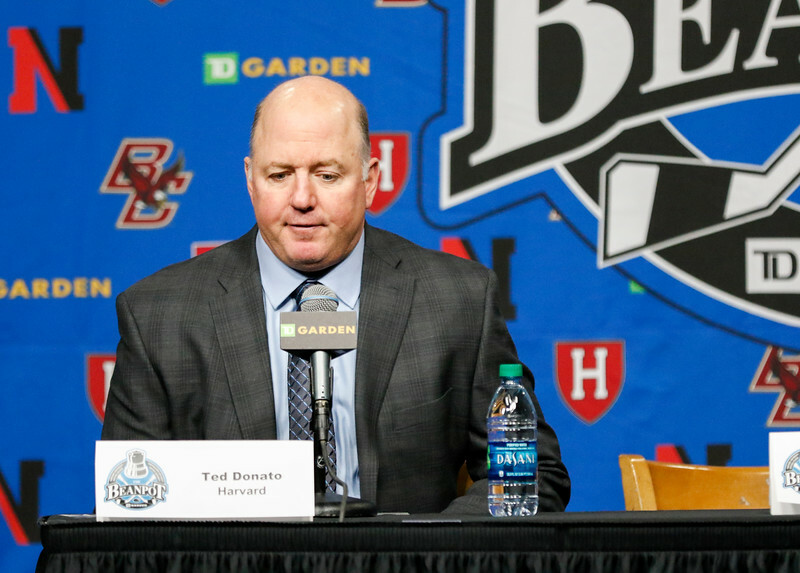 Harvard head coach Ted Donato '91 speaks at the postgame conference after the 3-2 OT semifinal loss. Despite the ending, Madsen’s overall performance (39 SV, 2.20 GAA, .929 SV%) was solid and included some game-changing saves. Staring down the ice at the Arizona Coyotes prospect, however, freshman net-minder Jake Oettinger put forth an even sturdier effort (47 SV, 1.46 GAA, .959 SV%) for BU (15-11-2, 10-7-2 Hockey East). 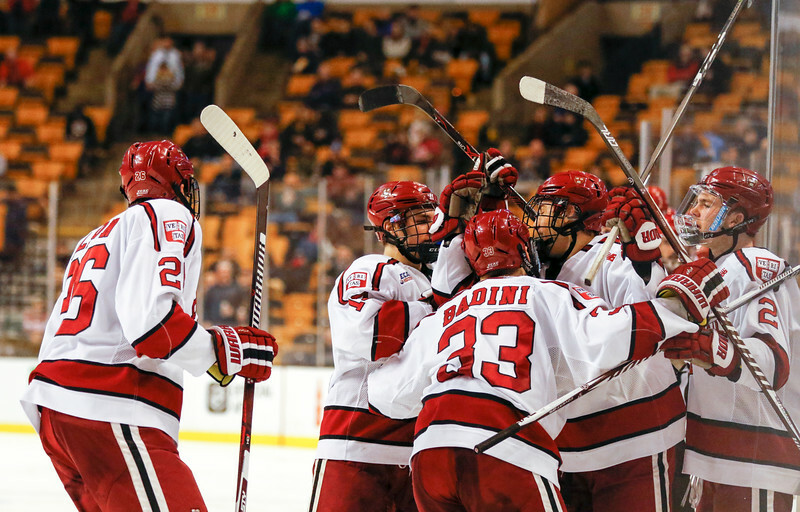 The Crimson (10-9-4, 9-5-3 ECAC) entered this year’s Beanpot looking to defend last year’s tournament crown. With the loss, though, the program’s pursuit of its first back-to-back Beanpot victories comes to an end. The prospect of the Beanpot’s first Harvard-Northeastern final—in 66 years of the tournament—also died with Amonte’s double-overtime game-winner. Tri-captain Merrick Madsen turned away 39 of the 42 shots he faced on the night, standing tall on 2 of 3 BU power plays. The puck dropped in the third period with the two teams even at one. Harvard was carrying play offensively, outshooting BU, 32-17, through 40 minutes. But the ice tilt didn’t stop the Terriers from seizing the lead. Just 32 seconds into the final frame, BU captain Brandon Hickey fired a shot at the Crimson’s own letter-wearer, Madsen. The net-minder gave up a juicy rebound, and a charging Hickey regained the puck before backhanding one past the goal line. Just thirty seconds into the middle frame, BU notched its second goal of the game, off the stick of captain Brandon Hickey. Not deterred by the early tally, Harvard equalized a mere minute and a half later. Sophomore forward Nathan Krusko tapped a puck into the neutral zone and started a 3-on-2 headed toward Oettinger. Krusko, last year’s Beanpot MVP (2–1—3 in 2017 final), got the puck back after crossing into the offensive zone. His slapshot bounced up high on Oettinger, and freshman forward Jack Badini, streaking into the goal area, hammered it home. Badini was one of three freshmen between both teams to score in the contest. So much for rookies shying away from big moments. The Anaheim Ducks prospect notched his first Beanpot goal in his first tournament game. Coach Donato, though, was among the least surprised regarding Badini’s precocious play. The team celebrates Jack Badini's third-period tying goal. Badini, a freshman, notched his first ever Beanpot point on the tally. Play soon settled down, and despite solid chances both ways, the teams’ skated to a tie through regulation, setting the stage for Amonte’s eventual game-winner. Coming into the overtime classic, the Terriers were enjoying their best hockey of the season. Winners of its last five and unbeaten in its last seven before the tilt, BU has resurrected its season after playing a portion of the campaign below .500. Due to the recent favorable results, BU was knocking on the door of Monday morning’s USCHO top-20 rankings, receiving the most votes among teams not on the big board. Between the Terriers’ recent hot stretch and their desire to avenge last year’s final defeat, the Crimson faced a plenty-motivated squad. 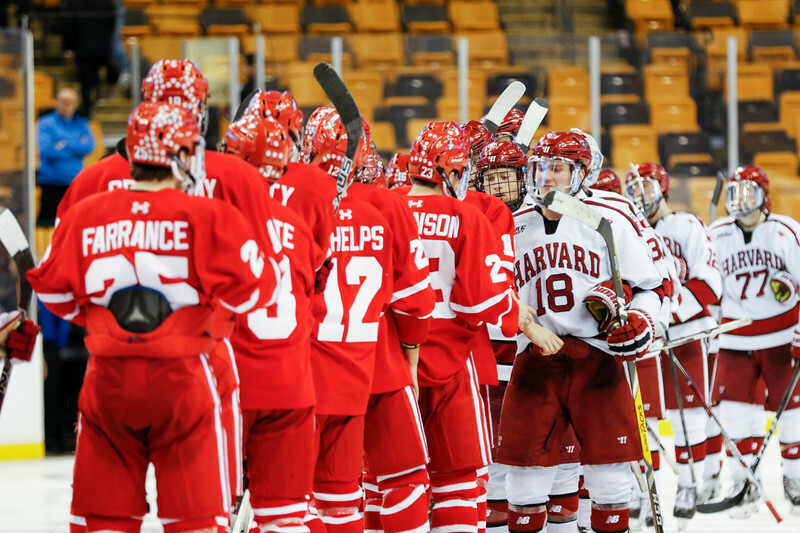 Another important win in the Beanpot semifinal may vault the squad back into the poll. 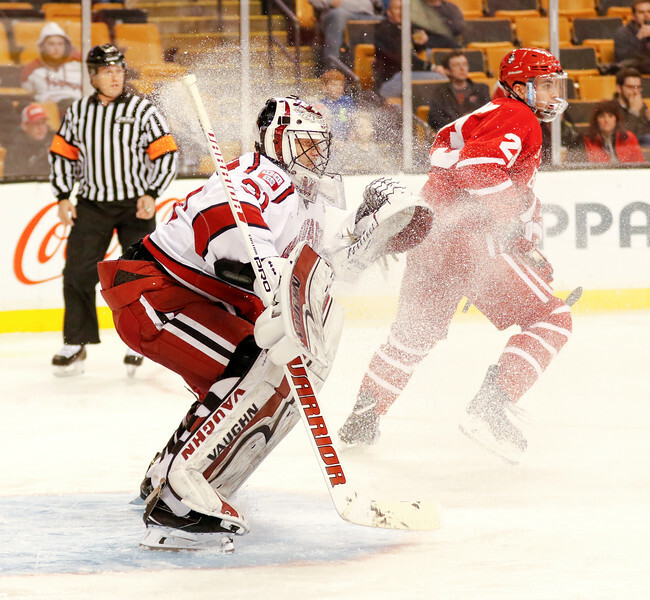 Unlike in the teams’ 2017 Beanpot meeting, BU opened the scoring in Monday’s tilt. 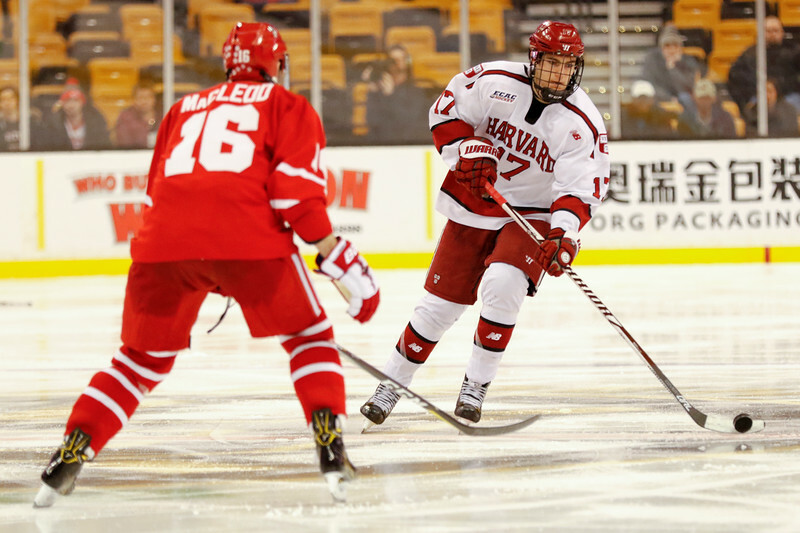 Harvard sophomore John Marino went to the box for crosschecking Terriers freshman Brady Tkachuk, and BU cashed in on the subsequent power play. Eight minutes into the opening frame, rookie forward Logan Cockerill saw a puck bounce out to the left of Madsen and wasted no time putting his fourth of the season past the tri-captain. 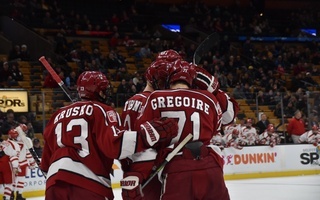 The power play proved futile once again for Harvard, as coach Donato’s group went 0-for-3 with the man-advantage against the Terriers. The team is now scoreless on the power play over its past four games, posting a 0-for-14 mark during that time. Even strength, the Crimson looked more dominant. 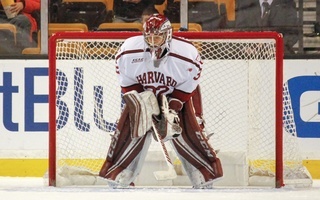 Despite entering the middle frame trailing by a goal, Harvard continued to throw everything it had on Oettinger. After an ambitious 28 shot attempts (12 SOG) in the first, the team continued more of the same in the second stanza, only this time getting more pucks through the defense and on cage. Of its 32 attempts that period, the Crimson hit the target 20 times. 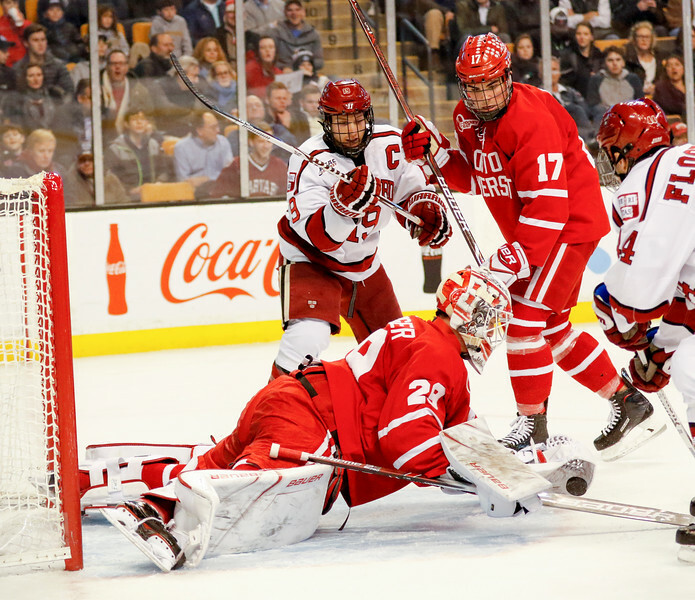 The Crimson crashed the net early and often, but BU sophomore goalie Jake Oettinger stood his ground. Eventually, the surge of offense was too much for Oettinger and the Terriers blue line. 35 minutes into the game, Harvard’s Ty, he of the Pelton-Byce variety, evened the contest with a top-shelf wrister. 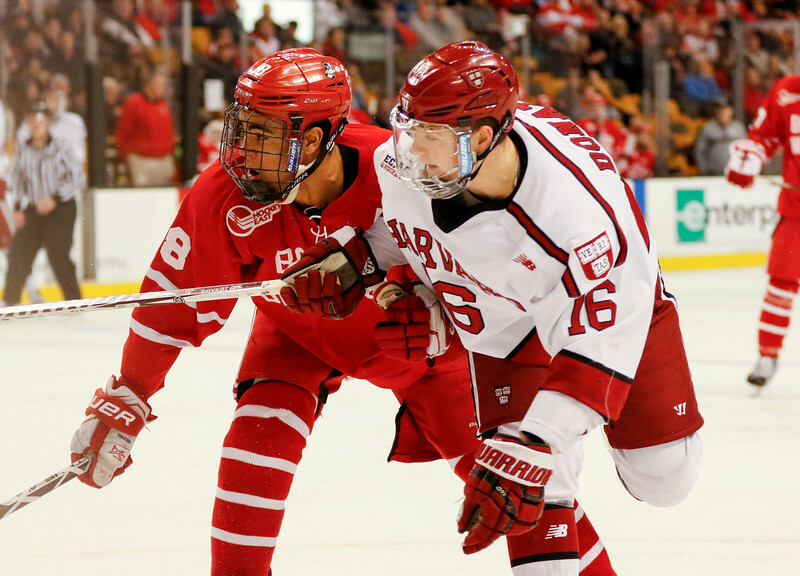 Sophomore forward Ty Pelton-Byce scored Harvard's first goal of the night to tie BU, 1-1. Donato emerged from a board-battle with puck at the right circle. The Scituate, Mass., native turned goalward, where Oettinger was waiting with squared shoulders. Despite his reputation as a sniper, Donato fed Pelton-Byce in the high slot, and a quick release from the sophomore found twine. The goal marked Pelton-Byce’s first career Beanpot point. Donato now says goodbye to his team—albeit temporarily—and ships off to PyeongChang, South Korea, to represent team USA in the Winter Olympics. One of the Crimson’s main tasks moving forward will be maintaining offensive firepower without the team’s centerpiece. The Crimson's Ryan Donato and BU's Jordan Greenway may have been foes during the Beanpot but will be teammates on the American squad at the 2018 Winter Olympics. 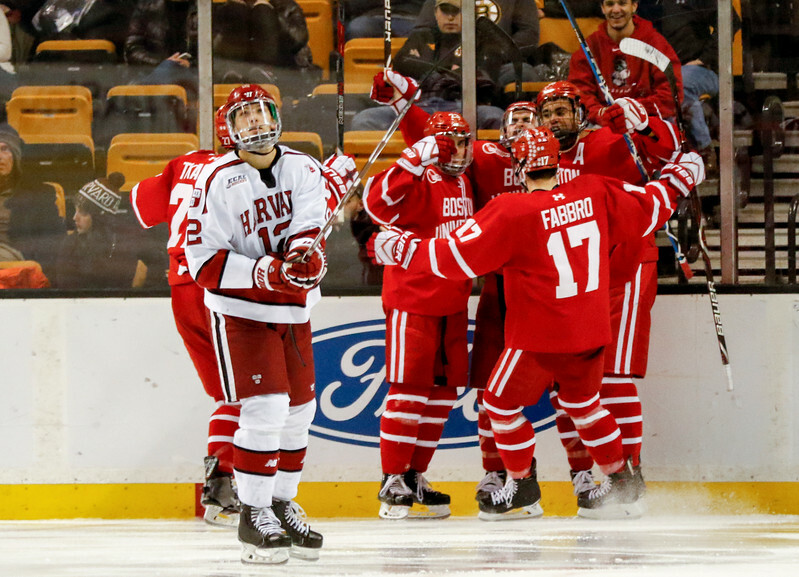 Monday’s affair marks the second time in the last four Beanpots that Harvard has gone to double overtime with BU. 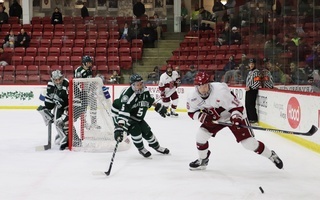 In 2015, the Crimson fell, 4-3, to the Terriers in the second frame of extra time.